Wiley, 2003-07-23. 6. Hardcover. Used:Good. Wiley, 2005-05-11. 6th Edition, 2005 JustAsk! Editi. Hardcover. Used:Good. Fox, Robert W.; Pritchard, Philip J.; McDonald, Alan T.
Wiley. PAPERBACK. 0470234504 Like New Condition. . Fine. Wiley. PAPERBACK. 0470234504 New Condition. . New. Wiley, 2008-08-11. 7. Hardcover. Used:Good. Wiley. Used - Good. Ships from Reno, NV. Shows some signs of wear, and may have some markings on the inside. 100% Money Back Guarantee. Shipped to over one million happy customers. Your purchase benefits world literacy! Wiley. Used - Good. Ships from UK in 48 hours or less (usually same day). Your purchase helps support the African Children's Educational Trust (A-CET). Ex-library, so some stamps and wear, but in good overall condition. 100% money back guarantee. We are a world class secondhand bookstore based in Hertfordshire, United Kingdom and specialize in high quality textbooks across an enormous variety of subjects. We aim to provide a vast range of textbooks, rare and collectible books at a great price. Through our work with A-CET we have helped give hundreds of young people in Africa the vital chance to get an education. We provide a 100% money back guarantee and are dedicated to providing our customers with the highest standards of service in the bookselling industry. McDonald, Alan T.; Fox, Robert W.; Pritchard, Philip J.
Wiley. Hardcover. 0471202312 New Condition. . New. Fox, Robert W.; McDonald, Alan T.; Pritchard, Philip J.
Wiley. Hardcover. 0471735582 New Condition. . New. Wiley. Hardcover. 0471742996 New Condition. . New. Wiley. Hardcover. 0471742996 Like New Condition. . Fine. Wiley. Hardcover. 0471202312 Like New Condition. . Fine. Wiley India Pvt. Ltd., 2012. Softcover. New. 18 x 24 cm. 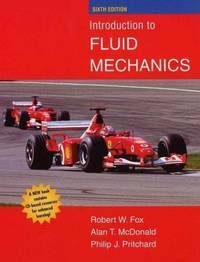 One of the bestselling books in the field, Introduction to Fluid Mechanics continues to provide readers with a balanced and comprehensive approach to mastering critical concepts. The new seventh edition once again incorporates a proven problem-solving methodology that will help them develop an orderly plan to finding the right solution. It starts with basic equations, then clearly states assumptions, and finally, relates results to expected physical behavior. Many of the steps involved in analysis are simplified by using Excel. Contents:- 1.Introduction 2.Fundamental Concepts 3.Fluid Statics 4.Basic Equations in Integral Form for a Control Volume 5.Introduction to Differential Analysis of Fluid Motion 6.Incompressible Inviscid Flow 7.Dimensional Analysis and Similitude 8.Internal Incompressible Viscous Flow 9.External Incompressible Viscous Flow 10.Open Channel Flow 11.Fluid Machinery 12.Introduction to Compressible Flow 13.Steady Compressible Flow Appendix A. Fluid Property Data Appendix B. Equations of Motion in Cylindrical Coordinates Appendix C. Videos for Fluid Mechanics Appendix D. Selected Performance Curves for Pumps and Fans Appendix E. Tables for Computation of Compressible Flow Appendix F. Analysis of Experimental Uncertainty Appendix G. SI Units, Prefixes, and Conversion Factors Appendix H. A Brief Review of Microsoft Excel (CD-ROM). Answers to Selected Problems. Index. Printed Pages: 776. Wiley, 2003-07-23. Hardcover. Good. Sturdy copy with some highlighting and underlining. Wiley. Used - Very Good. Ships from the UK. Former Library book. Great condition for a used book! Minimal wear. 100% Money Back Guarantee. Your purchase also supports literacy charities. Wiley. Used - Good. Former Library book. Shows some signs of wear, and may have some markings on the inside. Wiley. Used - Good. Shows some signs of wear, and may have some markings on the inside. Wiley. Used - Very Good. Great condition for a used book! Minimal wear. John Wiley & Sons, 1998-10. Hardcover. Good. Wiley. Used - Good. Ships from UK in 48 hours or less (usually same day). Your purchase helps support the African Children's Educational Trust (A-CET). Ex-library, so some stamps and wear, and may have sticker on cover, but in good overall condition. 100% money back guarantee. We are a world class secondhand bookstore based in Hertfordshire, United Kingdom and specialize in high quality textbooks across an enormous variety of subjects. We aim to provide a vast range of textbooks, rare and collectible books at a great price. Through our work with A-CET we have helped give hundreds of young people in Africa the vital chance to get an education. We provide a 100% money back guarantee and are dedicated to providing our customers with the highest standards of service in the bookselling industry. Wiley. Hardcover. 0471742996 Some light wear. . Good. 2008-08-11. 7. Wiley & Sons, Incorporated, John, 2003. Hardcover. Acceptable. Disclaimer:A readable copy. All pages are intact, and the cover is intact. Pages can include considerable notes-in pen or highlighter-but the notes cannot obscure the text. At ThriftBooks, our motto is: Read More, Spend Less.Dust jacket quality is not guaranteed. Wiley & Sons, Incorporated, John, 2003. Hardcover. Good. Disclaimer:A copy that has been read, but remains in clean condition. All pages are intact, and the cover is intact. The spine may show signs of wear. Pages can include limited notes and highlighting, and the copy can include previous owner inscriptions. At ThriftBooks, our motto is: Read More, Spend Less.Dust jacket quality is not guaranteed. Wiley & Sons, Incorporated, John, 2005. Hardcover. Very Good. Disclaimer:A copy that has been read, but remains in excellent condition. Pages are intact and are not marred by notes or highlighting, but may contain a neat previous owner name. The spine remains undamaged. At ThriftBooks, our motto is: Read More, Spend Less.Dust jacket quality is not guaranteed. Wiley & Sons, Incorporated, John, 2005. Hardcover. Good. Disclaimer:A copy that has been read, but remains in clean condition. All pages are intact, and the cover is intact. The spine may show signs of wear. Pages can include limited notes and highlighting, and the copy can include previous owner inscriptions. At ThriftBooks, our motto is: Read More, Spend Less.Dust jacket quality is not guaranteed. Wiley & Sons, Incorporated, John, 2008. Hardcover. Acceptable. Disclaimer:A readable copy. All pages are intact, and the cover is intact. Pages can include considerable notes-in pen or highlighter-but the notes cannot obscure the text. At ThriftBooks, our motto is: Read More, Spend Less.Dust jacket quality is not guaranteed. Wiley & Sons, Incorporated, John, 2005. Hardcover. Good. Disclaimer:A copy that has been read, but remains in clean condition. All pages are intact, and the cover is intact. The spine may show signs of wear. Pages can include limited notes and highlighting, and the copy can include previous owner inscriptions. The dust jacket is missing. At ThriftBooks, our motto is: Read More, Spend Less. Wiley & Sons, Incorporated, John, 2008. Hardcover. Very Good. Disclaimer:A copy that has been read, but remains in excellent condition. Pages are intact and are not marred by notes or highlighting, but may contain a neat previous owner name. The spine remains undamaged. An ex-library book and may have standard library stamps and/or stickers. At ThriftBooks, our motto is: Read More, Spend Less.Dust jacket quality is not guaranteed. Wiley & Sons, Incorporated, John, 2008. Hardcover. Very Good. Disclaimer:A copy that has been read, but remains in excellent condition. Pages are intact and are not marred by notes or highlighting, but may contain a neat previous owner name. The spine remains undamaged. At ThriftBooks, our motto is: Read More, Spend Less.Dust jacket quality is not guaranteed. Wiley & Sons, Incorporated, John, 2008. Hardcover. Good. Disclaimer:A copy that has been read, but remains in clean condition. All pages are intact, and the cover is intact. The spine may show signs of wear. Pages can include limited notes and highlighting, and the copy can include previous owner inscriptions. At ThriftBooks, our motto is: Read More, Spend Less.Dust jacket quality is not guaranteed. Wiley. Hardcover. 0471202312 Acceptable Condition. Five star seller - Buy with confidence! . Fair. Wiley. Hardcover. 0471202312 Good Condition. Has a small amount of underlining. No CD/DVD(s) Included. Five star seller - Buy with confidence! . Good. Wiley. Hardcover. VERY GOOD. Light rubbing wear to cover, spine and page edges. Very minimal writing or notations in margins not affecting the text. Possible clean ex-library copy, with their stickers and or stamp(s).